Sedum species are a varied group of drought tolerant perennials that are easy to grow. All species are from Central, America, Europe, Africa and the Mediterranean area, however they come from a range of climates and vary greatly in growth habit. Some are very low growing, others have a taller growth habit. Generally they are easy care and will grow well in full sun to part shade. They are commonly called the ’Stonecrops’ and are members of the Crassulaceae family. 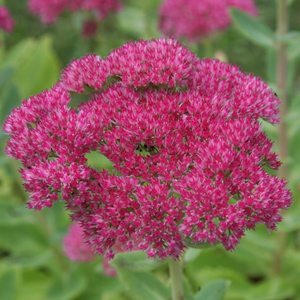 Some have become popular garden plants including the plant we call Sedum ‘autumn joy’ (Hylotelephium telephium, syn S. telephium) which is probably the best known of all. A taller growing variety, Sedum ‘Matrona’ is worth seeking out and many low growing ground cover types are also available for sale online. Sedum praealtum (S. praeltum) is one such low growing succulent from Mexico reaching only 10 -20 cm also known as ‘Green cockscomb’. Easy to grow in the garden in a well drained soil, Sedum also look great in terracotta pots. Care and maintenance is very easy, but remember that the different species do vary greatly. Propagation is easy by division, larger clumps may be divided and replanted anytime during the growing season. S. telephium ‘Autumn Joy’ and Sedum spectabile are two good varieties. The starry flowers are very attractive to butterflies, birds and bees and have exceptional vase life. S. spurium ‘Dragon’s Blood’ is another popular plant with red glossy foliage and a trailing habit. Sedum flowers start as a green mass, slowly turning pink and then a deep rust.